Home » Ramadan 2018 » Ramadan in Doha 2018 – Everything You NEED To Know! Ramadan in Doha is a time of piety, family, and celebration. Whether you are a Muslim or not the month of Ramadan is an important time in the Middle East, with plenty of Ramadan events and traditions. When is Ramadan in Doha 2018? The Muslim Calendar is a lunar calendar and as such it is 11 days shorter than the Gregorian calendar, hence the starting date of Ramadan changes each year. This year Ramadan is expected to start on or around the 16th May 2018 in Doha Qatar, with the Eid Al’ Fitr festival expected to be on June 16th 2018. The Eid festival lasts for three days and is celebrated at events across the country. These dates are dependent on the sighting of the new moon – expect official announcements to be made. Qatar’s best hotels get involved with elaborately designed Ramadan Tents for Iftar and Suhoor Buffets which showcase a variety of cuisines including live cooking stations. They are similar to Friday Brunches, however there is a greater focus on regional dishes and traditional entertainment (and there is no alcohol). Local restaurants will also offer buffets and set menus with traditional items available. The children festival of Garangao occurs in the middle of Ramadan. It is a uniquely Qatari tradition where local children dress up in brightly coloured traditional clothing, and head out into the neighbourhood singing the Garangao song and receiving nuts and sweets from elders. It has become a bigger event with local and expat children taking part in festivities across Doha and Qatar. In Qatar there are particular cultural traditions that provide endless entertainment to families, such as the Ramadan cannon. There will be Ramadan events in many public venues and local malls in Qatar. Expect larger events at Aspire Zone, The Pearl-Qatar, and Katara Cultural Village. Many of the hotels have specials promotions and deals during Ramadan – if you are looking for Ramadan Room packages be sure to check if Iftar or Suhoor is included in the promotion. Generally the venues don’t get smoky until very late in the evening, so if you are looking for smoke-free Ramadan venues for a family-friendly fun then go earlier in the day. *There is no alcoholic beverage service during the whole month of Ramadan. It will usually resume the first day of Eid, but check with each individual outlet. For people who are not fasting there will be some hotel restaurants open offering a la carte menus or breakfast buffets during the day. Also takeaway and delivery options may be available during the afternoon at some restaurants and local cafes. Make sure to check the timings and don’t just turn up – you may expect your favourite restaurant to be open, only to find it has been closed for Ramadan. We will keep updating this feature to include details about Ramadan dining options, including Ramadan Iftars, so be sure to keep checking back! Evoke the senses of One Thousand and One Arabian Nights at Mondrian Doha’s first Ramadan Tent in the Moonstone Ballroom. Alf Leila w Leila Ramadan Tent features an array of culinary offerings including traditional hot and cold Mezzes, Manakish, live stations, mixed grills and the finest selection of desserts. With VIP tents. IFTAR: From 6:00pm until 8:00pm. Priced at QR 225 per person. SOHOUR: From 9.00pm until 2:00am. Priced at QR 275 per person. Corporate and Group bookings available. Celebrate the Holy Month of Ramadan at the “Sihr Al Sharq” tent in Al Dasha and Al Sonbok ballrooms at Sharq Village & Spa, a Ritz-Carlton Hotel in Doha. Capture the magic of the East with a sumptuous buffet, featuring traditional Qatari cuisine and International dishes, serenaded with soothing sounds of the Oud and live oriental band. IFTAR: From sunset to 8pm. Priced at QAR 250 per person. SOHOUR: From 8:30pm. to 2:00am. Priced at QAR 250 per person. Four Seasons Hotel will feature an elaborate Ramadan tent located within Al-Mirqab Ballroom,with a stylish, contemporary design influenced by traditional Arabic architecture. The culinary experience includes extensive Iftar and Sohour menus featuring traditional Ramadan cuisine, and complemented by an array of delicious international dishes, including 25 buffet and live cooking stations. Highlights include special Ramadan and Qatari dishes, a Japanese sushi station, dim sum carousel, pasta and carving station, Arabic and western desserts station featuring unique dishes such as nitrogen baklava ice cream. In addition to the delicious global fare, Four Seasons will feature an extensive Super Foods menu with organic and gluten free options. IFTAR: From 6pm to 8pm. Priced at QAR 235 per person. SOHOUR: From 10pm to 1:30am. Priced at QAR 275 per person. Children aged 5-12 years receive 50 percent savings from the regular price. 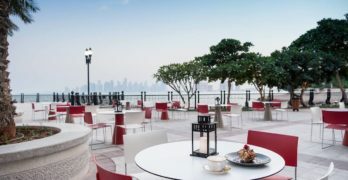 The Pier, Shisha Terrace and Arabica will also offer Iftar & Suhour set menus throughout the Holy Month. Celebrate the spirit of the Holy month in a lavish Ramadan majlis featuring the true Arabic Elegance and embark on a unique culinary voyage through Arabia to savour traditional Ramadan delicacies with a modern flair. Indulge in a sumptuous family-friendly feast that blends traditional Arabic essences with contemporary culinary excellence while enjoying Arabic live music and the Tanoura dancer. Break your fast with an array of delicacies enthused with local and international influences, with only the very best in fresh and wholesome ingredients displayed in a traditional style buffet. Highlights include live cooking stations offering a wide selection of hot and cold mezzeh, salads, soups, grills, dedicated stations featuring Sushi & Dim Sum as well as international cuisine from Qatar, Turkey, Asia, Italy & Mexico. The extensive selection of desserts includes mouthwatering Turkish & European decadent delights, traditional Arabic sweets, Turkish ice cream and dates. Shisha will be available during Suhour only. IFTAR: From sunset to 8pm. Priced at QAR 220 per person. SOHOUR: From 9pm to 12:30 am (Saturday to Wednesday); from 9pm. to 1:30am (Thursday and Friday). Priced at QAR 220 per person. 50% savings for children aged 6 to 12. Children below 6 dine with compliments. In the heart of the museum, with spectacular views of the Doha skyline, IDAM offers an innovative and flavorsome selection of contemporary French Mediterranean cuisine designed with an Arabic twist. Timeless classics of local and regional cuisine, with most ingredients sourced locally in Qatar.Philippe Starck’s unique and exquisite decor creates a sophisticated atmosphere. IDAM invites you to experience a truly exceptional Iftar menu priced at QAR290 per person – specially designed for an unforgettable Arabian experience of hospitality and generosity, ceremoniously served at your table. During the Holy Month of Ramadan indulge in an “Arabian Nights” buffet in Flying Carpet featuring an abundant spread of Arabic delicacies, live cooking stations and signature Arabic desserts. IFTAR: From Maghreb prayer until 8:00pm. Priced at QR 190 per person including Ramadan beverages (bookings above 5 pax, special rate of QR 175). SOHOUR: From 11.00pm until 2.00am. Priced at QR 160 per person including Ramadan beverages (bookings above 5 pax, special rate of QR 145). Experience the joy of Ramadan at Marsa Malaz Kempinski with a focus on sharing, togetherness and celebration. During the holy month, Marsa Malaz Kempinski brings together the finest traditions in a setting of royal grandeur at their Sahara Royal Tent, pairing intimate social gatherings with unparalleled culinary experience. IFTAR: From sunset until 8:00pm. Priced at QR 240 per person. SOHOUR: From 9.00pm until late. Priced at QR 290 per person. IFTAR: Priced at QR 170 per person. Break your fast and spend a memorable Iftar and Sohour at Azraq Restaurant, where sumptuous dining and live music await you every night. Explore Ramadan favourites of lamb ouzi and mansaf, makbous and couscous. Savour the sweet delights of halawet el jibn and katayef. Unwind to the soothing sounds of the live Moroccan band, as the young ones delight in a henna corner, bouncy castle and more. Available from 30th May-14th June 2018. SOHOUR: From 10.30pm until 2:30am. Priced at QR 270 per adult and QR 135 per kid for non-resident guests | QR 220 per adult and QR 110 per kid for resident guests. Al Masa Ramadan tent will host an Iftar buffet experience that includes an array of interactive cooking stations featuring traditional Arabic and International favourites as well as a lavish buffet spread that includes over 100 dishes. It offers a family-friendly environment where kids are welcome and entertained with special activities, including events on garangao. Traditional Middle Eastern specialties such as hot and cold mezze, slow roasted lamb Ouzi with oriental rice and tasty Arabic sweets and desserts are all on the menu. IFTAR: From sunset until 8:00pm. Priced at QR 195 per person, including Ramadan juices & water. SOHOUR: From 9.00pm until 1:30am. Priced at QR 140 set menu during weekdays | QAR 160 Buffet during the weekends. Celebrate the Holy month of Ramadan at the specially-designed Al Andalusia Ramadan Tent set into the rooftop at DoubleTree by Hilton Doha. Featuring an ambience and entertainment that will take you back to the Oriental Andalusian nights. IFTAR: Priced at QR 180 per person. SOHOUR: Set Menu served during weekdays priced at QR80 | Weekend Buffet priced at QR 180 per person. Embrace the Holy Month of Ramadan at Fraser Suites Doha with your family and friends, and enjoy an array of International and Arabic dishes, featuring soothing Arabian melodies. IFTAR: Priced at QR 175 per person. SOHOUR: Priced at QR 145 per person. 50% savings for children aged 6 to 11. The Ramadanak Tent at Al Silia Ballroom has been transformed into an Arabian dream, capturing the perfect ambiance for a memorable Ramadan experience. Iftar buffet features Middle Eastern and International flavours with a variety of live stations including fresh seafood. The dessert station offers an extensive selection of seasonal sweets for all the family. With live music from a traditional band. Shisha is available at Al Maha/Majlis. IFTAR: From sunset to 8:30pm. Priced at QAR 220 per person. SOHOUR: Until 1:30am. Priced at QAR 220 per person. The Sultan’s Tent offers an unforgettable Ramadan experience celebrating the rich flavours and sounds of the season. Features a variety of delicious International and Middle Eastern menu items, including 10 live cooking stations for Iftar and Suhour. IFTAR: Doors open 30 minutes before Iftar. Until 8:15pm. Priced at QAR 230 per person. SOHOUR: 9:15pm until 2:00am. Priced at QAR 285 per person. Celebrate a lively Ramadan gathering at the Fawanees Ramadan Tent with a traditional ambiance and an extensive buffet featuring authentic Arabic and International dishes, live cooking stations, and a tempting dessert station with all your favourite Arabic sweets. IFTAR: Priced at QAR 205 per person. SOHOUR: Priced at QAR 175 per person. Head to ForKnife restaurant for a Iftar buffet that focuses on authentic Ramadan favourites and Qatari cuisine. Also features International delicacies and desserts. Celebrate Ramadan with family and friends at Hyde Park Coffee Shop with a buffet featuring traditional and International menu items. IFTAR: From sunset until 8:00pm. Priced at QAR 140 per person. For an evening Ramadan experience take a visit to the beautiful Shahrazad Ramadan Tent featuring an extensive Sohour buffet and live performances. Take a journey with Westin with an Ottoman twist, with its Ramadan Tent that has been inspired by a traditional Arabian street market. Features live oriental tunes, and a variety of International, Turkish and Qatari dishes along with a sweet assortment of desserts crafted by a dedicated team of Turkish chefs. IFTAR: From sunset until 8:30pm. Priced at QR 195 per person. SOHOUR: From 9.30pm until 1:30am. Priced at QR 195 per person. Indulge in Shangri-La’s exotic Ramadan Tent that has been decorated to look like the traditional streets and souqs of Turkey, and featuring Turkish chefs. Live entertainment and shisha will be available during Suhoor. There will be a dedicated children’s dining area and playroom, including fun activities, henna artists and a photo booth. IFTAR: Priced at QR 230 per person. Children aged 6-12 years at QAR 115; children under 6 dine for free. Enjoy exquisite Ramadan Nights at The St. Regis Doha with a breathtaking décor that will take you on a fascinating tour around Doha. The Corniche Tent also offers live cooking stations, sumptuous seasonal specials and live entertainment. IFTAR: From sunset until 8:00pm. Priced at QR 230 per person. SOHOUR: From 9.30pm until 2:00am. Priced at QR 290 per person. Buffet price inclusive of selected Ramadan beverages. Celebrate the Holy Month of Ramadan at Doha’s iconic landmark, with traditional Arabian hospitality at the Turath Ramadan Tent at Al Majlis. Experience the rich Qatari heritage with a lavish Iftar meal or enjoy an intimate Suhoor. Featuring Oriental and International favourites and live cooking stations. With live band performance, and Kanoon player. Special rates for suhour buffet with hubby bubbly. IFTAR: From 6:00pm until 8:00pm. Priced at QR 250 per person. SOHOUR: From 9.30pm until 2:00am. Priced at QR 200 per person. Children aged 6 to 12 years get 50% off; under 6s dine for free. Delight in the traditional Iftar buffet at The Square with an extensive variety of Arabic and international culinary delights including mezze, fresh seafood, grilled meat and live ouzi cooking stations. Indulge in traditional dessert options that will satisfy any sweet tooth. For Sohour The Square will offer a large menu items only. IFTAR: Sunset until 8:30pm. Priced at QR 180 per person. SOHOUR: From 9.00pm until 11:00pm. A la carte menu only. IFTAR: Sunset until 9:00pm. Priced at QR 210 per person. SOHOUR: From 9.30pm until 1:30am. Priced at QR 160 per person. Welcome the breaking of the fast at the Kan ya Makan (Once Upon a Time) Tent at Gallery restaurant with an exquisite buffet featuring authentic Middle Eastern specialties, traditional Qatari dishes, and international favourites. Enjoy live cooking stations, a delicious dessert station, and Ramadan beverages. The Kan Ya Makan kids experience features a playground filled with creative toys, puzzles, cartoon stations, interactive games and much more. IFTAR: Priced at QR 180 per person; QAR 90 per child aged 6 to 12 years. Children under 6 free when accompanied by an adult. SOHOUR: Priced at QR 100 per person; QAR 50 per child aged 6 to 12 years. Children under 6 free when accompanied by an adult. Welcome Ramadan with the varied culinary delights on offer at the Almas Ramadan Tent, featuring an extensive range of Arabic delicacies, International cuisine, live cooking stations and Ramadan drinks. With traditional entertainment. Celebrate Ramadan at Le Cigalon Restaurant with an Iftar Buffet experience with wide array of Mezzeh, salads, traditional and International dishes, and tempting desserts. Enjoy authentic traditions at La Cigale’s Ramadan Tent with an indulgent Suhour buffet featuring a variety of Oriental and International dishes, live cooking stations and succulent desserts section. With Oud player, and shisha. *Please note that all information provided is accurate at time of publishing; we advise that you double-check info at time of booking as venues may amend their offers.